Teg, Bumbi, Derrick, Lopez, Elliott Heath and Evan are going to try their luck at 5K at the Columbia last chance meet. 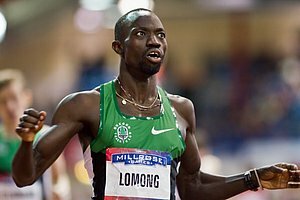 My money is on Lomong who appears ready for great things,although he did miscount the laps on a 400 meter track last year and has twice the laps here. I for one would like to see Derrick, Bumbalough and Jager rewrite their PR’s as a preview for big outdoor seasons from all three. It appears that Solinsky, Webb, Huling and German will be rooting for them rather than racing. Interesting that the article states it is being set up as a race to get the “A” standard for Worlds this summer. Funny to be aiming for that indoors. That never would have been possible back in the day of banked board indoor tracks. interesting clash between lopez and his great mile run and derrick and his XC victory. edge to lopez IMO. You can get standards indoors. The same issue was raised last year after Derrick ran 13:19i, and I believe we found something in the endless bureaucratic USATF junk that said indoor marks count. And I’d also give Lomong the edge right now. Derrick’s XC win (over Ritzenhein no less) was impressive, but to me it just says he’s really, really fit, not necessarily race sharp or ready to light up Lomong, Bumbalough, or Jager (not that I think he could even if he was sharp). Hell after I wrote that, I’d put Derrick in fourth behind those three. How sick would it be if Galen Rupp/Lagat popped in and raced all of the above out of nowhere? Does anyone know their definitive schedules for the rest of indoor season? you can get it if the track meets certain standards, which i believe to be 200m or smaller. How sick would it be if Galen Rupp/Lagat popped in and raced all of the above out of nowhere?